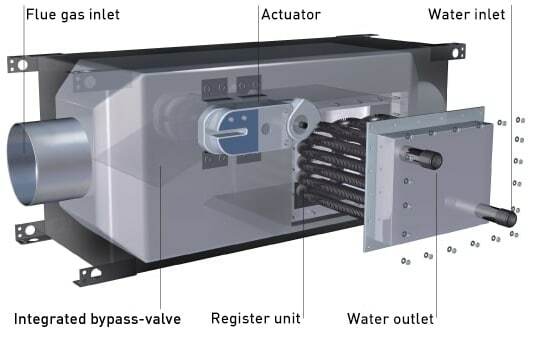 Heat recovery system OekoAWT, efficient energy recovery. The exhaust gas heat exchanger OekoAWT increases the efficiency of your heating system. The OekoAWT covers all boiler output ranges from 15 kW to 1 MW. Almost all fuel types are compatible. The exhaust gas heat exchanger can be used in heating systems that use oil, gas, log wood, pellets or wood chips as a fuel. Even with process heat such as from bakeries and laundries, the heat from the warm exhaust air can be recovered. The OekoAWT is fundamentally compatible with all heating systems with high exhaust gas temperatures. The OekoAWT reduces the exhaust air temperature and provides the energy gained from the cooling process for further use. This energy can be used for different purposes like typical applications, space heating and hot water production. The OekoAWT is ideally installed directly behind the heating source. Alternatively, it can also be installed further up in the exhaust flue. Laser-welded finned tubes in the water heat exchanger provide a high efficiency of heat recovery. Bypass valves ensure trouble-free operation in a continuous and in a full-load operation. In addition, the OekoAWT is characterized by low flow resistance, resulting from an optimized flue gas duct. As every situation is different, we do not offer standardized exhaust gas heat exchangers. Each OekoAWT is a custom-made device to meet the special requirements of the customer. This guarantees a maximized utilisation under the local conditions. At hotels, commercial and industrial plants, the main purpose is to decouple heat production from manufacturing plants, steam extractors, ovens, etc. If no heat is required, the bypass motor switches to bypass mode. In this way, affiliated offices and warehouses can be heated inexpensively and even the complete hot water needs can be met. The OekoAWT can be cleaned during operation via the inspection or cleaning opening. To clean the OekoAWT, the water heat exchanger is simply removed laterally from the housing and cleaned. Alternatively, it is possible to fit the OekoAWT with an automatic cleaning mechanism.